Anglers enjoy our beach just about anytime but especially in the fall when the fishing is superb. At that time of year their 4WD vehicles are often lined up close to the water's edge. In 1981 one fishermen decided to take a nap in his SUV. 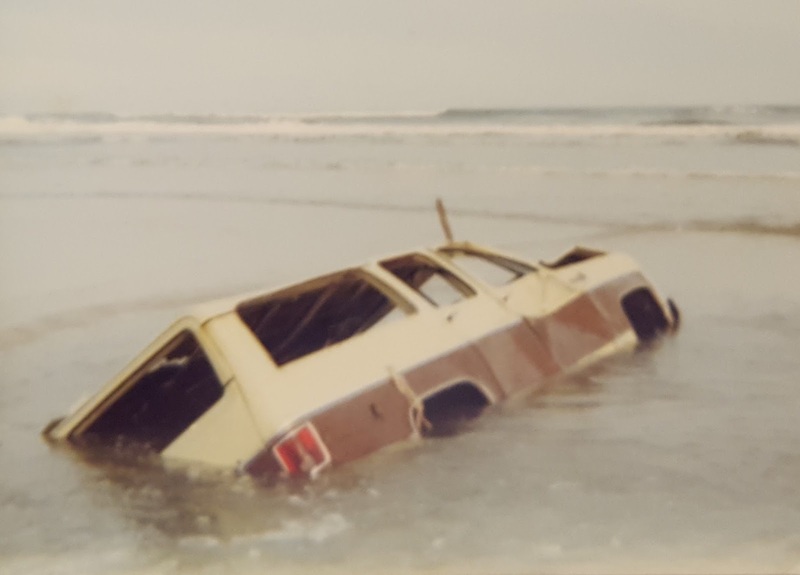 When he woke up the waves were lapping under his vehicle, and all four tires had sunk into the wet sand. Over the next several tidal changes the SUV was completely inundated, then rolled back and forth by the breakers. During one low tide I noticed that the tires looked brand new...and were the exact size as the ones on my Chevy Blazer. Only the right side two tires were exposed, but they were still partially buried in the sand. With help from family, and a lot of effort, we dug the tires free and removed them. They served well until the Blazer was junked years later. I don't believe the SUV was ever extricated. I think it just gradually settled into the quicksand and was covered by more sand. I guess it's still buried out there. So, if you are planning to park near the water's edge, don't fall asleep as the tide is coming in! 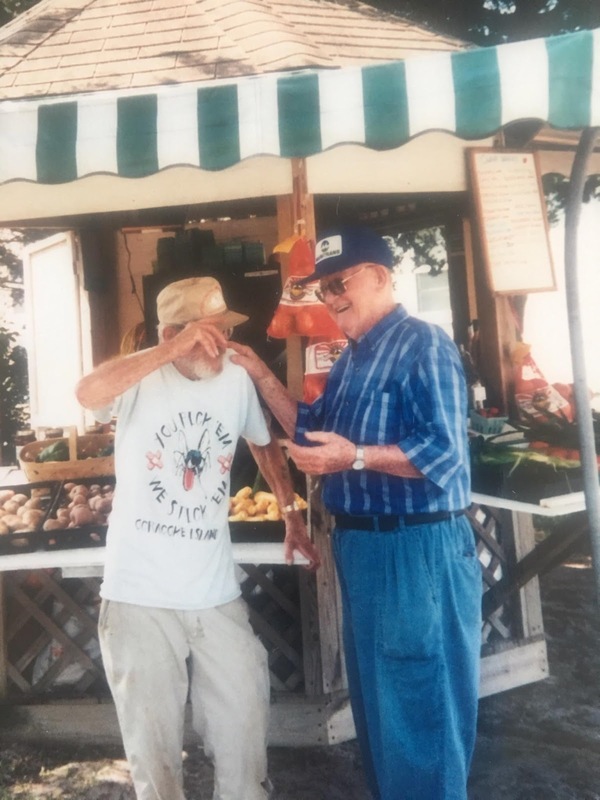 This month's Ocracoke Newsletter is a delightful story written by Dr. Warren Silverman, who in 1981 became the island's resident physician after forty years without a doctor. The story is about Dr. Silverman's very first Ocracoke patient, island native Maltby Bragg (1904-1985). You can read the story here: https://www.villagecraftsmen.com/my-first-island-patient-by-dr-warren-silverman/. How many lighthouses are there in North Carolina? But there are more! Some readers will know about Old Baldy and Oak Island Lights. 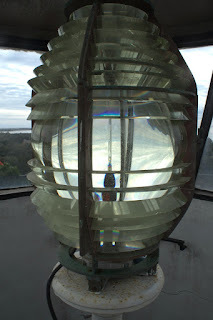 In addition, I have written about the Diamond Shoals Light and Hatteras Beacon. According to one article I discovered (https://www.ranker.com/list/lighthouses-in-north-carolina/jennifer-lee) there are (or were) twenty-one different lighthouses in North Carolina. Maybe some of our readers know of another one or two. If so, please leave a comment. Barbara Garrity-Blake and Karen Willis Amspacher have compiled a Heritage Guide to the Outer Banks Byway titled Living at the Water's Edge. In their section, "Love, Sickness, and Death," they write, "The lack of doctors [on the Outer Banks and coastal North Carolina] made home remedies a necessity.... Tuberculosis, pneumonia, typhoid fever, colitis, and the flu were just some of the afflictions [residents dealt with]." L.P. O'Neal of Avon contributed this comment: "Back in the old days they used to say these old women were floating around the road on Laudanum." Yesterday I mentioned paregoric, a camphorated tincture of opium. Laudanum is another product that also contains opium, but whereas paregoric contains 4% opium, Laundanum contains 10% (in powdered form). According to Wikipedia, "By the 19th century, laudanum was used in many patent medicines to 'relieve pain ... to produce sleep ... to allay irritation ... to check excessive secretions ... to support the system ... [and] as a soporific. The limited pharmacopoeia of the day meant that opium derivatives were among the most effective of available treatments, so laudanum was widely prescribed for ailments from colds to meningitis to cardiac diseases, in both adults and children. Laudanum was used during the yellow fever epidemic. Innumerable Victorian women were prescribed the drug for relief of menstrual cramps and vague aches. Nurses also spoon-fed laudanum to infants ... 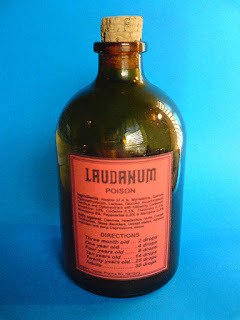 Initially a working class drug, laudanum was cheaper than a bottle of gin or wine, because it was treated as a medication for legal purposes and not taxed as an alcoholic beverage." Of course, federal regulations in the early 20th century began to recognize the addictive nature of Laudanum, and its use declined dramatically. As late as the 1970s scores of discarded Laudanum bottles could still be dug up behind many of the older homes on Ocracoke. Yesterday I wrote about Grove's Chill Tonic, a late 19th century and early 20th century patent medicine developed to treat malaria. The creator of the tonic, Edwin Wiley Grove (1850–1927), was a prohibitionist and abstainer, so his medicine contained no alcohol, as so many other patent medicines did. Another popular product in the 18th and 19th centuries, which did contain alcohol as well as opium, was designed to treat diarrhea, cough, and pain in children and adults. Paregoric became a household remedy on the Outer Banks, especially during times when no professional medical providers were serving the area. It was used to calm worrisome children and to soothe the gums of teething infants. Once the narcotic and addictive properties of opium and its derivatives became better understood in the early 20th century, the federal government began regulating its use and sale. 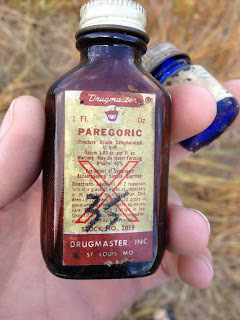 Nevertheless, until 1970 paregoric could still be purchased in the United States at a pharmacy without a medical prescription. Paregoric is one of several patent medicines containing opium that were used extensively on Ocracoke and elsewhere on the Outer Banks. Another favorite was Laudanum. Look for more about that medicine tomorrow. For much of its history, the Outer Banks was without professional medical care. Midwives, "healers," and parents relied on home remedies to treat illnesses and injuries. During the 19th century, and into the 20th century, patent medicines became popular alternatives to local herbs and poultices. 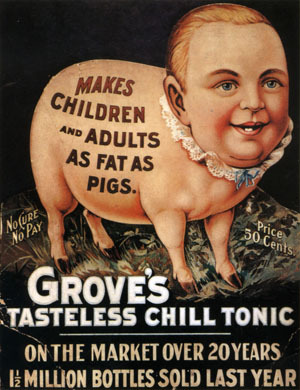 One such medicine was Grove's Tasteless Chill Tonic. In 1878 Edwin Wiley Grove (1850–1927) patented a quinine mixture that he claimed eliminated the bitter taste of pure quinine. The medicine was marketed as a cure for the chills and fever associated with malaria. According to NCpedia, "From the earliest attempts at colonization, North Carolina was plagued by malaria. Carried in the blood of the 15th century European explorers, and transmitted by the bite of the ubiquitous Anopheles mosquito, the disease found an easy foothold amongst the Native Americans. Successive waves of colonists, naturally settling near sources of water, provided a vulnerable and concentrated population on which the mosquitoes could feed. Millponds, wells, and open farmland (where water could pool and stagnate) also provided a rich breeding ground." At the time Grove's Chill Tonic was introduced, malaria was considered the "scourge of the South." The tonic became an overnight sensation, and a staple in Outer Banks homes for decades. In addition to being used as a remedy for malaria, it was also often taken in the fall to prevent colds. NCpedia explains that, "An increasingly educated public, the aggressive use of chemical insecticides, and a reduction in available breeding places for mosquitoes, all contributed to a decline in [malaria], and by the late 1940's, malaria had all but disappeared from the state." Not surprisingly, Grove's Chill Tonic also disappeared. Today, the only evidence of the tonic is an occasional bottle unearthed in someone's back yard. Look for information about other patent medicines popular on the Outer Banks in future posts. Below is a detail from the official 1953 North Carolina Highway Map. It shows a dotted line for the "Toll Fy" (Frazier Peele's wooden, 4-car ferry across Hatteras Inlet), double-dotted lines on Ocracoke (the Unimproved [sand] Road the length of the island), and a dotted line for "Toll Ferry-No Cars" (the mailboat route from Atlantic to Portsmouth to Ocracoke. In 1953 Ocracoke was just on the verge of being discovered by more than hunters, fishermen and a few adventurous souls. In the summer of 1981 Warren Silverman, M.D. moved to Ocracoke. It had been four decades since Ocracoke had a resident doctor. Dr. Silverman's wife, Jean, a nurse, accompanied him. They practiced from their home until the island's new Health Center was completed the following year. Dr. Silverman also made house calls. In 2017 Dr. Silverman visited the island, and stopped by to say hello. He regaled us with stories of his time at Ocracoke. At my request, Dr. Silverman sent me a delightful story he wrote about his very first Ocracoke patient, island native Maltby Bragg (1904-1985). We have published Dr. Silverman's story as this month's Ocracoke Newsletter. You can read it here: https://www.villagecraftsmen.com/my-first-island-patient-by-dr-warren-silverman/. 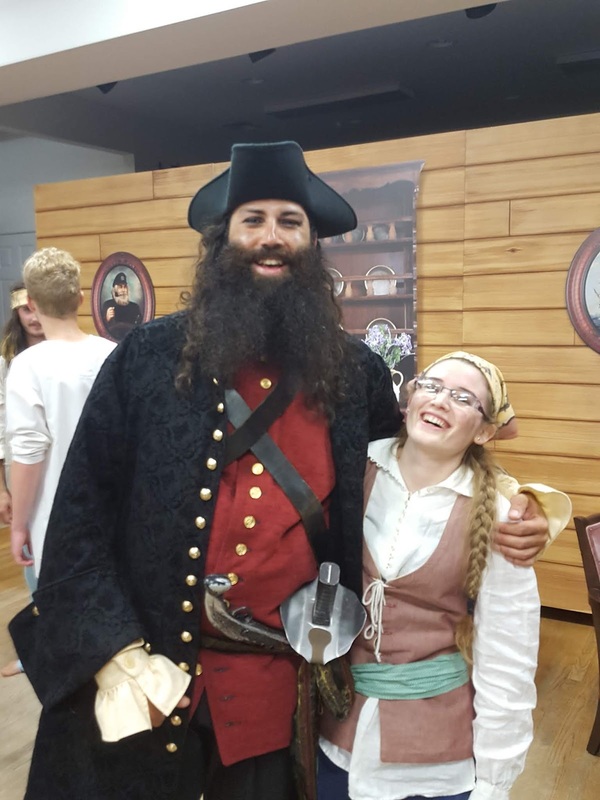 Julie Howard's musical, A Tale of Blackbeard, has entertained islanders and visitors on and off since 1974. This year marks the production's 11th season during the last 44 years. Not coincidentally, 2018 is the 300th anniversary of the death of Blackbeard during a naval battle at Ocracoke in November, 1718. Produced by Ocracoake Alive [a 501(c) 3 non-profit with a mission “to enrich the Ocracoke Island community by encouraging and sponsoring cultural, artistic, educational, and environmental activities including the production of plays, musicals, musical events, exhibits, schools, workshops, and festivals.”], A Tale of Blackbeard highlights the creative talents of a host of island residents. In 2018, regular shows will be held at the Ocracoke Community Center on Mondays (June 11-25), and at the Ocracoke School Gym Auditorium, Monday, July 2 - Monday, August 13. Summer shows start at 8 PM with the door opening at 7:30 PM. Tickets are $15 Adults/$7 Kids. Performances at the Ocracoke School Gym have plenty of room for walk-ups, while the Ocracoke Community Center has limited seating. Click here for more information: https://www.ocracokealive.org/tale-of-blackbeard.html. Our latest Ocracoke Newsletter is a history of the Ocracoke Lighthouse, with information (and an artist's sketch) about the earliest lantern room. You can read the Newsletter here: http://www.villagecraftsmen.com/ocracoke-lighthouse/. Here is a quiz for our long-time readers. The following photo was taken sometime in the late 1990s on Ocracoke Island. Who are the two people in the photo? If you know the answers to any of the above questions please leave a comment. Also, if you have any stories about anyone or anything in the photo please share them. I wonder how many of our readers are familiar with Raleigh Bay. 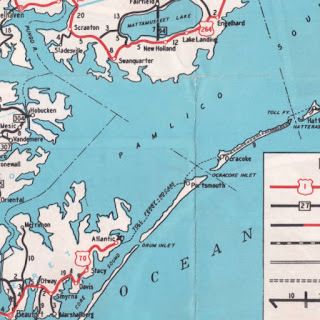 Roger Payne, in his book Place Names of the Outer Banks, describes it as a 75 mile long bight along the coast of Carteret County, Hyde County (Ocracoke Township), and Dare County. The coordinates of Raleigh Bay are 35°14'40"N 75°31'38"W (northeast end), 34°34'57N 76°32'01"W (southwest end), and 35°00'00"N 76°00'00"W (center). A bight is a large open bay created by a bend or curve in the coastline. Wikipedia explains that "explorers defined a bight as a bay that could be sailed out of on a single tack in a square-rigged sailing vessel, regardless of the direction of the wind (typically meaning the apex of the bight is less than 25 degrees from the edges). Click here to see an aerial view of Raleigh Bay: https://mapcarta.com/21319764. 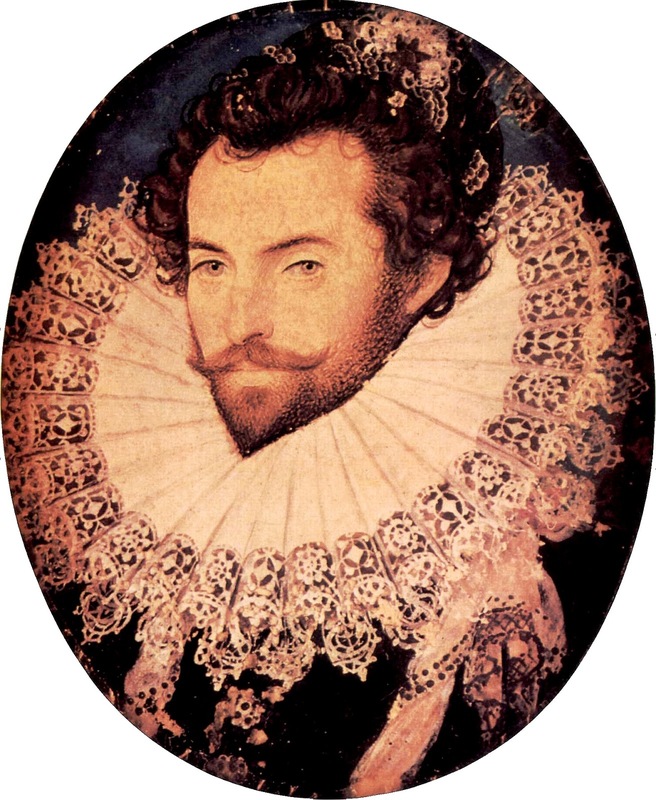 Of course, Raleigh Bay was named for Sir Walter Raleigh, English organizer whose expeditions explored the Outer Banks in the 16th century. I have written about yaupon tea in the past, but I just recently discovered two informative articles about this island drink: "The Yaupon Holly Tradition," by Jared Lloyd in the Coastal Review Online (https://www.coastalreview.org/2014/11/yaupon-holly-tradition/), and "The Forgotten Drink That Caffeinated North America for Centuries" by Ben Richmond (https://www.atlasobscura.com/articles/what-is-yaupon-tea-cassina). Lloyd explains that Native Americans in the Carolinas used the leaves of the yaupon holly, a shrub that grows wild on Ocracoke Island, to brew a tea rich in caffeine.The leaves were harvested and roasted in the early summer when caffeine content was at its peak. Yaupon was traded with other tribes as far west as Illinois. Early colonists learned to drink yaupon tea when royal taxes and import duties made other teas too expensive. Richmond points out that "William Aiton, an eminent British botanist and horticulturist, director of Kew Gardens, and “Gardener to His Majesty,” is credited with giving cassina [yaupon tea] the scientific name it bears to this day: Ilex vomitoria. Ilex is the genus commonly known as holly. Vomitoria roughly translates to 'makes you vomit. '” Richmond goes on to write that "Cassina does not make you vomit. Both modern scientific analysis and centuries of regular use by Southerners confirms this. But several early European accounts of cassina mention vomiting. Cassina seems to have been used in elaborate purification rituals where men sat in a circle, sung or chanted, and took turns chugging and then throwing up hot cassina. Yet other detailed, first-hand accounts of indigenous people drinking cassina don’t mention vomiting at all. Anthropologist Charles M. Hudson and others have suggested that a plant with emetic properties may have been added to the cassina brew (unbeknownst to European observers) or that the black drink ceremony may not have involved cassina at all." There is no question that yaupon tea rivals any of the commercial teas available for sale today. Lloyd reports that "the Outer Banks is thought to have been the last holdout [for drinking yaupon tea]. 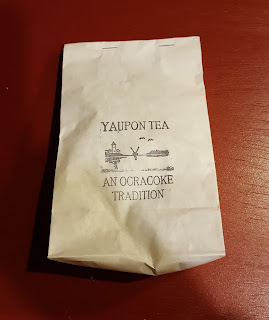 The tea was sold in restaurants along the Banks into the 1970s; Ocracoke Island is the last known location to have served yaupon tea." 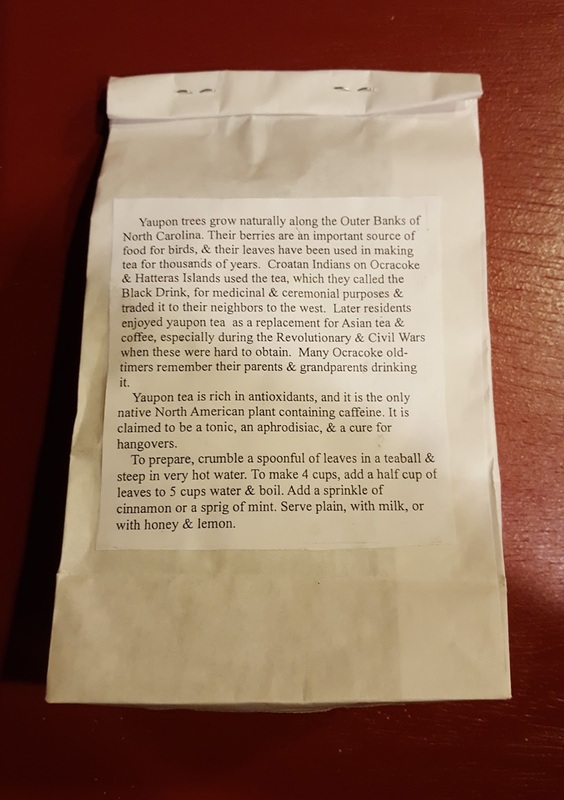 You may not be able to order yaupon tea in any restaurant today, but you can purchase a bag of locally harvested yaupon tea leaves ($8.00) in Village Craftsmen...and brew your own! Call (252-928-5541) or email us (info@villagecraftsmen.com) to place an order. Or stop by the Village Craftsmen on Howard Street to purchase yaupon tea in our gallery. The label on the back of the bag reads: "Yaupon trees grow naturally along the Outer Banks of North Carolina. Their berries are an important source of food for birds, & their leaves have been used in making tea for thousands of years. Croatan Indians on Ocracoke & Hatteras Islands used the tea, which they called the Black Drink, for medicinal & ceremonial purposes & traded it to their neighbors to the west. 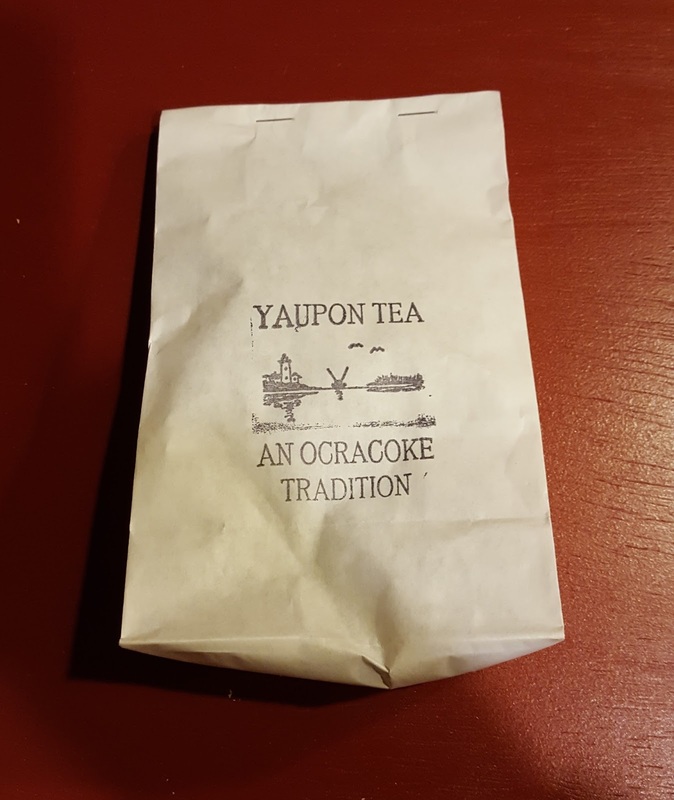 Later residents enjoyed yaupon tea as a replacement for Asian tea & coffee, especially during the Revolutionary & Civil Wars when these were hard to obtain Many Ocracoke old-timers remember their parents & grandparents drinking it. "Yaupon is rich in antioxidants, and it is the only native North American plant containing caffeine. It is claimed to be a tonic, an aphrodisiac, & a cure for hangovers. "To prepare, crumble a spoonful of leaves in a teaball & steep in very hot water. To make 4 cups, add a half cup of leaves to 5 cups water & boil. Add a sprinkle of cinnamon or a sprig of mint. Serve plain, with milk, or with honey & lemon." Jared Lloyd's article ends on this note: "Today, modern science has begun to focus on yaupon holly as another possible weapon in the fight against cancer. Thus far, yaupon holly has proven itself to be packed full of antioxidants, beneficial polyphenols and anti-inflammatory properties that show promising results against colon cancer." Soft shell crabs are a delicacy enjoyed by many folks along the North Carolina coast, although they may seem unappetizing to those not familiar with this culinary delight. Soft-shell crabs have recently molted, leaving their old exoskeleton behind. Crabs must be removed from the water as soon as they molt or a new hard shell will develop within hours. When crabs are soft, almost the entire animal, less the mouth parts, gills and abdomen, can be eaten. Cooks usually deep fry or sauté soft shell crabs. Nowadays, commercial fishermen typically catch blue crabs, then hold them in saltwater tanks if they want soft shells. As soon as the crabs molt, they are removed from the water, which stops a new hard shell from forming. Ellen Marie Cloud, in her book, Portsmouth the Way it Was, recounts a 1963 interview with Miss Mattie Gilgo (1885-1976) by her grandson, Julian Gilgo. While discussing the several salt water ditches in Portsmouth village, Julian remarks, "There's been a many a soft crab caught in them ditches, ain't they? On high tide they come up them ditches. I caught a many one with a rake, myself." 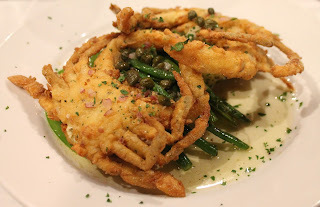 If you've never tasted soft shell crab, be sure to order some the next time you see them on a menu! Megalops cyprinoides is a medium-sized tarpon, also known as the Indo-Pacific tarpon or simply herring. Although widely distributed, as expected, their range is generally in the Indo-Pacific Oceans, including the waters of Australia, Japan, and North Africa. However, Henry Fowler's 1945 book about fish found in waters from Maryland to Texas, Study of the Fishes of the Southern Piedmont and Coastal Plain, documents four of these fish found by Ocracoke resident Wallace Springer "in beach pool formed by storm September 15-16, 1933." 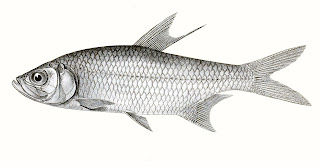 The fish were small, between 52 and 87 mm ( 2" - 3.5") long. Even accounting for the hurricane, I wonder how these fish ended up in the North Atlantic Ocean. You never know what might turn up on our beaches! Access to the light was by wooden steps; then an iron ladder to the lantern room. The illuminating apparatus is "4th Order"
A 1200 gal. oil storage tank is located outside of the concrete oil house. You can read the entire report here: http://uslhs.org/inventory/light_station_report.php?id=874. "The Enemy in Eastern N.C. – We learn from northern papers that the yankees in and about Newbern in this State, held an election on the 1st inst. for a member of the Lincoln Congress. There were two candidates, a man named Piggot, and Foster, a Maine yankee who was driven off from Murfreesboro at the commencement of the war. It is reported that Piggot was elected. The election was held under the direction of the traitor Stanly, and of course was conducted by thieving yankees and a few mean, low-life, unworthy natives. No respectable native North Carolinian participated in the bogus election. "The Wilmington Journal has information from Hyde county, showing that the people of that county are being oppressed and plundered by Stanly and his minions in a terrible manner. A mean hireling of Stanley’s, named Bannister Midyett, has a company of low characters under his command, and the people are forced to take an oath of allegiance to Lincoln or have their property destroyed. Those who refuse to obey Stanley’s orders are sent to Newbern and imprisoned. Edward Stanly is a meaner man than beast Butler [Benjamin F. Butler]." Such harsh words call for more research! However, I have already written about Union sympathizers on Hatteras Island. As I wrote in 2014, Foster (Charles Henry Foster) was even repudiated by members of President Lincoln's inner circle, being labeled an "unprincipled scamp and cheat." Zina (Zini to family and friends) Williams was born on Ocracoke Island in 1890. He died in 1970. "And the sons of Shimei: Jahath, Zina, and Jeush, and Beriah. These four were the sons of Shimei." "[W]e are told that Shimei the Gershonite had four sons, among whom Zina (זינא). But in the next verse, this man is called Zizah (זיזה). And to make the confusion complete: in the verse prior, we learn that Shimei had not four but three sons, and their names are nowhere near similar to the four listed in the next verse. There are basically two ways to explain all these discrepancies: (1) either the Chronicler had no idea what he was doing, but somehow managed to write a world hit, or (2) we moderns have no idea what the Chronicler is up to, but the ancients did, and that's why this Book wasn't discarded for junk but rather venerated like the Word of God." A third possibility is that Chronicles is a compilation of several authors' work...different traditions cobbled together. We will probably never know. But why did William Warren and Julia Nancy Williams give their son the highly unusual name Zina (their other three children were named Jordan, David, and Annie)? That too we will probably never know. Not too surprisingly, Ocracokers are wont to refer to Swan Quarter and the surrounding mainland as "the county." Of course, Ocracoke Island is also part of Hyde County. It's just that the mainland and the Outer Banks are very different in many ways. What we today refer to as Hyde County was formed December 3, 1705, as Wickham Precinct, one of three precincts within Bath County. In 1712 it was renamed Hyde Precinct in honor of Edward Hyde (1667 – September 8, 1712), the first Governor of North Carolina. 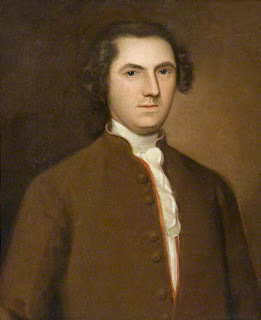 Although he served only four months (May 9, 1712 until his death from yellow fever), he governed during Cary's Rebellion and the Tuscarora War. Hyde Precinct became Hyde County in 1739 when Bath County was abolished. A number of other changes in the geography of Hyde County were made in subsequent years. In 1845 Ocracoke Island was transferred from Carteret County to Hyde County. The boundaries of Hyde County have changed more than those of any other county in North Carolina. Many islanders travel to Hyde mainland by the Swan Quarter ferry only to continue to Washington or Greenville to visit doctors and/or dentists, or on their way to points west. Every now and then Ocracoke residents are called for jury duty. That means catching the 7 a.m. ferry to Swan Quarter (the judge always waits to begin proceedings until Ocracokers arrive at the court house, at about 9:30.) Most judges are considerate of islander's travel issues, and dismiss court early enough to catch the 4:30 ferry back home. When that doesn't happen, islanders "drive around" through Manteo and Hatteras Island, catching a late ferry across Hatteras Inlet. According to a 2006 article in the NC State Economist, "North Carolina law requires keepers of livestock to enclose their livestock, poultry and horses with an adequate fence. Livestock is broadly defined as bovine or equine animals, swine, sheep or goats. Horses are included in this definition, regardless of whether they are kept for business or for pleasure. As a fencing-in state, North Carolina is distinguished from states located primarily, but not entirely, in the western U.S. where cattle grazing predominates, and landowners who want to keep livestock off of their property are forced to fence them out. North Carolina was also a fencing-out state in the 1800s, but the law changed around the turn of the twentieth century due to population growth and the expansion and increased importance of crop production." During the 18th and 19th centuries Ocracoke ponies ranged freely on the island with little need for fences since the sound, ocean, and inlets served as natural obstructions. It was only in the village that fences became necessary. Islanders typically installed two fences, an inner fence to enclose their garden, and an outer fence to keep wild horses out. At that time North Carolina was a fencing-out state. In 1917/1918 all of North Carolina except the Outer Banks became a fencing-in state. The current livestock law was not adopted for Ocracoke until 1958. Even then the statute applied to all livestock except the wild Banker ponies. With the establishment of the Cape Hatteras National Seashore and the construction of a hard-surfaced road the length of Ocracoke Island, free ranging ponies became a hazard for automobiles, and automobiles threatened the lives of the ponies. As a result, a large fenced-in pasture was established in the middle of the island. There are currently just under 20 ponies (although small and powerful, Banker "ponies" are full-grown horses) in the Ocracoke herd. You can read more about them here: https://www.nps.gov/caha/learn/historyculture/ocracokeponies.htm. In the past I have written about vendues on Ocracoke Island (https://villagecraftsmen.blogspot.com/search?q=vendue). The word vendue derives from the French, and was used on the Outer Banks to describe a public sale of shipwrecked cargo. Today we might use the word auction. In recent years the Ocracoke Fire Department has held a fund-raising auction every Memorial Day weekend, and Ocracoke Alive sometimes sponsors an art auction during the June Ocrafolk Festival. The first public auction in recent years that I know of was conducted in the school yard as a PTA fund-raiser. This photo was taken October 26, 1973. 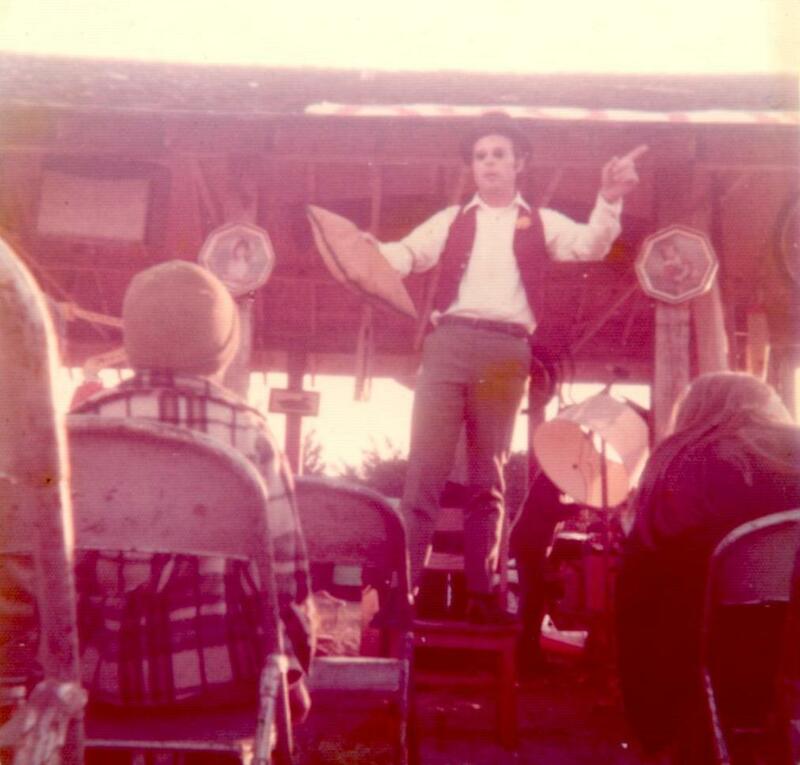 Can any of our readers identify the auctioneer? Five years ago Daniel Couch wrote an article for Village Realty titled, Shipwreck Salvaging is a Time-honored Tradition on Hatteras and Ocracoke. "Actually, there appears to be some basis for that assessment. Brother L. O. Wyche, beloved preacher at Ocracoke, was conducting a revival at the Methodist Church in the mid-1890s when word spread through the congregation that a lumber-laden vessel had struck near The Swash. "Preaching came to a halt as the men executed an orderly dash out the doors. The next night, one of the ladies of the church scolded Brother Wyche, saying the episode was unchristian-like, and our Lord could not possibly condone such intoxicating behavior.